ROME – A recent surge in Desert Locust populations due heavy rains and cyclones has caused an outbreak in Sudan, Eritrea, and rapidly spreading along both sides of the Red Sea to Saudi Arabia and Egypt, the Food and Agriculture Organisation (FAO) has said. The United Nations agency called on all the affected countries to step up vigilance and control measures to contain the destructive infestations and protect crops from the world’s most dangerous migratory pest. FAO says the good rains along the Red Sea coastal plains in Eritrea and Sudan have allowed two generations of breeding since October, leading to a substantial increase in locust populations and the formation of highly mobile swarms. At least one swarm crossed the Red Sea to the northern coast of Saudi Arabia in mid-January, followed by additional migrations about one week later. Groups of mature winged adults and a few swarms also moved north along the coast to southeast Egypt at the end of the month. In the interior of Saudi Arabia, two generations of breeding also occurred in the southeastern Empty Quarter region near the Yemen-Oman border after unusually good rains from cyclones Mekunu and Luban in May and October 2018 respectively. A few of these swarms have already reached the United Arab Emirates and southern Iran with a potential risk of spreading further towards the India-Pakistan border. “The next three months will be critical to bring the locust situation under control before the summer breeding starts,” Keith Cressman, FAO’s Senior Locust Forecasting Officer, said about a week ago. According to FAO, breeding will continue in February on the Red Sea coast in Sudan and Eritrea, causing a further increase in hopper and adult groups, hopper bands and adult swarms. As vegetation dries out, adult groups and a few swarms are likely to move north along the Red Sea coast in Eritrea to Sudan, and from the Red Sea coast of Sudan to the Nile Valley in northern Sudan. 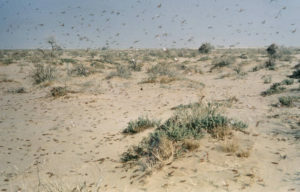 Adult locust swarms can fly up to 150 km a day with the wind. Female locusts can lay 300 eggs within their lifetime while an adult insect can consume roughly its own weight in fresh food per day – about two grams every day. A very small swarm eats the same amount of food in one day as about 35,000 people posing a major threat to food security. The Desert Locust Information Service at FAO Headquarters in Rome has been operating a global monitoring and early warning system since the 1970s as part of the preventive control strategy. More than two dozen frontline countries in Africa, the Near East and southwest Asia contribute to this system by undertaking regular surveys in the desert to look for green vegetation and Desert Locust.